Not too long ago, Muffin Uptown and I were watching some very talented people tripping the light fantastic on television. "I wish I knew how to tap dance," she said. "You could learn," I said. "You should take lessons." "Yeah. Maybe. Probably not, though." And that's all there was to that; nobody said anything funny. But I got the distinct impression that MU thinks that ship has sailed--that it's just too late for her to learn to dance. 22-year-olds are like that, sometimes. She'll probably change her mind. We all know boatloads of 44-year-olds who've decided to change ships in mid-stream. Sometimes, they just hike up their skirts and wade for the banks. Which is an apt description for what I've decided to do. I am leaving the fast-paced and exciting life of a busy and important publishing professional to stroll down the ivy-laden halls of higher learning. Very soon, instead of dripping crunchy and delicious taco juice onto painstakingly crafted editorial copy, I will instead by crying over hundreds of student-generated essays that were quite possibly stolen from the internets. That's 125 students, one essay every other week, for 16 weeks. Will somebody who knows how to do math send me an email telling me how long I can expect to last? image, Jack Delano. 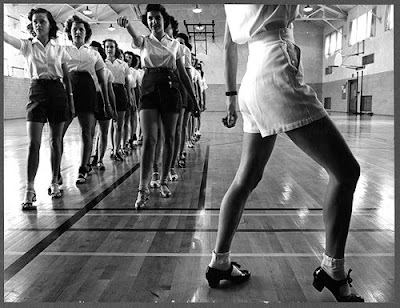 Library of Congress, Tap dancing class in the gymnasium at Iowa State College, Ames, Iowa. I know some of you might be wondering if I will miss the director gig. See this and this. Reno says that's 1000 essays. Maybe you can even parlay that higher if your lucky.